Christmas is a good time of year for Puccini's ever popular – perhaps his best-loved – opera, premiered in 1896. Parisian garrets, snow-covered street scenes, the infectious gaiety of Cafe Momus in the Latin Quarter on Christmas Eve, each of Puccini's four acts genuinely provide us with a slice of Bohemian life, four scenes de la vie boheme that Murger had created in his writings and that Puccini captured with such verismo authenticity that Debussy allegedly once said to Manuel da Falla: 'I know of no one who has described the Paris of that time as well as Puccini in La Boheme'. Well, here is another recording of this idiomatic work, this time from Atlanta, and evidently deriving from a series of live performances in the autumn of 2007. Knowing how crowded the Boheme field already is, Telarc have taken the sensible decision of issuing the 2 CD set for the price of one, and of including a full libretto (although it does not always precisely match the text as sung here). The cast is decent, if not stellar. The first ingredient of a memorable Boheme has to be a quartet of male principals – Rodolfo, Marcello, Colline and Schaunard – who gel together and who, in those pre-Friends days, can portray student life in all its raucous, messy glory. 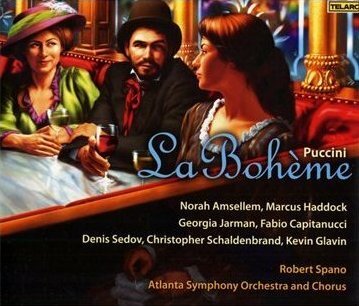 The Atlanta cast is a little too sedate and careful for my liking, but Fabio Capitanucci sings idiomatically and with passion as Marcello and I warmed increasingly to the dark timbre of Denis Sedov as Colline. That brings me to the opera's hero, Marcus Haddock as Rodolfo. I have heard him in the opera house in Germany and he has always impressed me with his warm, open tenor sound: what he lacks is that big and thrilling 'ring' that a memorable Rodolfo has to bring to the part. We do not get that in this performance, and so my enthusiasm is muted. But Haddock sings competently and decently, and any Boheme first-timers in the Atlanta audience will not have felt short-changed. Opposite him as Mimi is Norah Amsellem, whom I have never heard live. Once again, she sings the part accurately and with increasing intensity of feeling (those who have heard many Bohemes on disc may want to go straight to Act Four, where I think the whole performance takes fire in a way that the earlier acts do not) but there are two aspects of her singing that I do not really like. First, her vibrato is too pronounced and too liberally applied, to my ears at least. Mimi has to be a lovable, pathetic creature when we first encounter her, and Amsellem simply sounds too plummy. Secondly, her vowel sounds are all a bit dark for the Italian in which she is singing – there is a 'closed' quality to the voice that I do not find appealing. Track 9 is the one to hit ('Mi chiamano Mimi') – I don't think it will eclipse any of the great Mimis of the past. The other female lead is the Musetta of Georgia Jarman. 'Quando men' vo soletta' is taken too slowly for me, but Jarman has a touch of the soubrette in the voice and I would enjoy seeing her sing the part onstage. Once again, I was impressed with her transition from the flighty, flirty Musetta whom we first meet on the Momus café table to the more serious, intense Musetta of Act Four in Mimi's deathbed scene. Here she comes into her own. Robert Spano conducts what are clearly large forces: the whole production has a big, spacious orchestral sound and the chorus are well drilled. He knows the work well and seems to love it: his orchestra respond with a lot of orchestral detail, and the Direct Digital Stream recording sounds great in a five speaker set-up (audience applause is included). Tempi overall could be brisker – it may simply be that the big, concerted passages had to be taken slowly given the large numbers of singers and players involved. But what I miss most with this sort of approach is what the Italians call ambientismo – that preoccupation by all writers of verismo opera to evoke the milieu through the music, to actually compose the décor of the piece into the score. I have four famous Boheme CD and DVD sets of the past that have this quality in abundance, all in slightly different ways. The Atlanta forces do not really come close to that aspect of the work. Had they done so, this might have been more of a recording to be reckoned with for it does, as I have said, contain much that is commendable.